Origin and Habitat: Mexican states of Chihuahua, Durango and Coahuila. Habitat: Often found in arid plains with sandy-gypsum or gravely soil. 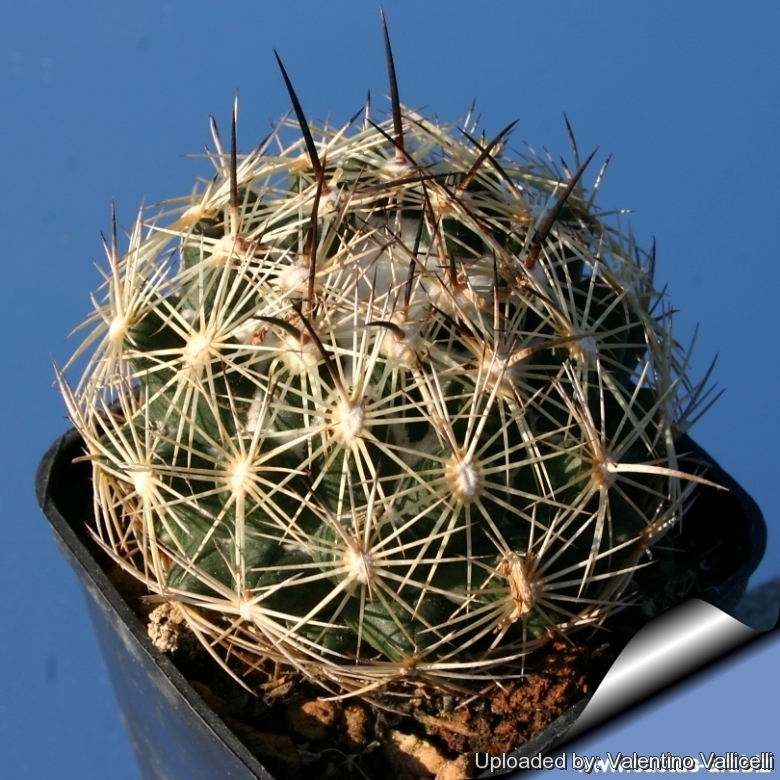 Description: Coryphantha salm-dyckiana is a globose cactus species, with 9-20 radial spines and 3-4 central spines of which the dominant one (sometime absent), straight, or partially recurving, 2-3 cm long, dark reddish brown. It is usually solitary or sometime forming clumps after a few years. This species has a wide range and shows a great variability either in habitat and in cultivation too. However the distinguishing characteristics of Coryphantha salm-dyckiana, appear to fall within the natural variation of Coryphantha delaetiana and it should be synonymized with the latter. Stem: Globose to shortly cylindrical, 6-10 tall and in diameter, dull greys-bluish-green, apex rounded woolly. Areoles: Round, approx 7 mm in diameter slightly woolly. Radial spines: 9-15(-20), thick, subulated, 10-20 long, radiating sideways and downward, straight or somewhat curving, grey or whitish. Central spines: Mostly 3-4 central spines of which the dominant one (sometime absent), straight, subulated or partially recurving, 2- 3 cm long, dark reddish brown with blackish tips. Flower: Funnelform, 4 or more cm in diameter, pale-yellow. Fruits: Green to tannish, oblong to large ovoid, juicy with attached flowers remnants. Notes: There is a long nomenclatural debate around this controversial species. The early description of Mammillaria salm-dyckiana by Scheer ( In: Salm-Diyck, Cact. Hort. Dyck. 1849:134, 1850) depicted a different plant with very large tubercles and only 8-10 radials and only one central spine, but this description correspond to the description of Coryphantha poselgeriana Dietrich 1851, the later combination Coryphantha salm-dickiana by Britton & Rose (In: Cactaceae: 4: 28, 1923) correspond to a plant with small tubercles, 15 radial spines, 1-4 central spines and correspond to the description of Coryphntha delaetiana (Quell 1908) Berger 1929. Since the name name of Coryphantha salm-dyckiana has continuously used in its incorrect sense its name has been rejected by the committee for spermatophytes in 2000. Cultivation and Propagation: Small growing and easy to to care in normal cactus compost and very willing to flower, Because of it’s small size makes a great potted plant specimen, great for beginning collectors, water sparingly and allow to dry between watering, needs good drainage. Watering should be curtailed during the winter months. Full sun but is tolerant and prefers light shade during the hot Summer months. And provide very good ventilation. Frost Tolerance: Hardy to - 5°C if kept dry. Propagation: Seeds (usually) or by the shoots of adult plants (if available).